The naval shipbuilding plan is undoubtedly a major step forward for industrial capability in Australia. … larger and more complex than the Snowy Mountains Hydro-Electric Scheme and the National Broadband Network. Irrespective of this particular claim’s validity, the investment of A$89 billion for nine new frigates, 12 submarines and 12 offshore patrol vessels is a substantial commitment to Australia’s security. The plan is a comprehensive approach to establishing a continuous program for building these platforms in Australia. 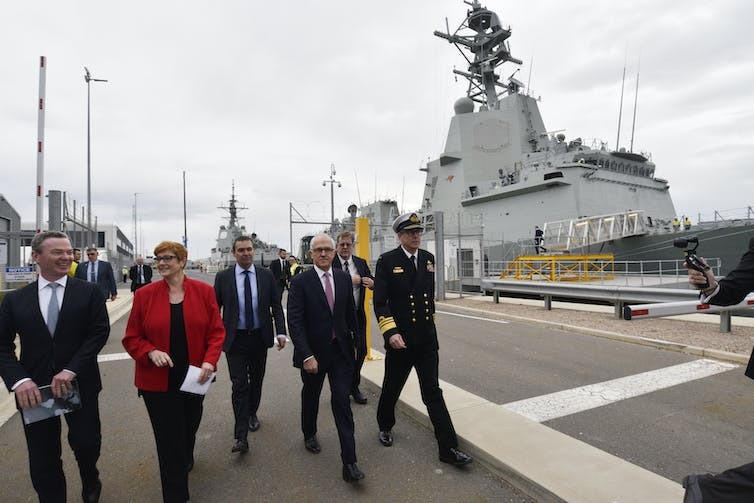 Apart from the future introduction of these and other vessels into service, one of the plan’s key outcomes is a “sovereign Australian capability to deliver affordable and achievable naval shipbuilding and sustainment”. The development of a sovereign capability is stated as “the government’s clear priority”. But what is sovereignty in this context? And is it attainable from the naval shipbuilding plan? The plan has two interconnected weaknesses when it comes to sovereignty. First, the Australian defence industry environment is dominated by companies whose parentage and ultimate control rest offshore. This is not necessarily a bad thing. But given the shipbuilding plan’s focus on Australian jobs and resources, it is a reality that needs confronting. To that end one might have expected to see, both in this document and in earlier ones, a definition of Australia’s defence industry – what it is and, importantly, what it is not. … where the technology is created, where the skills and intellectual property reside, where the jobs are created and sustained, and where the investment is made. A similar definition for Australia would provide a foundation for sovereignty in the shipbuilding environment to be properly assessed. The plan suggests the Australian subsidiaries of offshore companies will be considered as sovereign without discussing how local control might be maintained, and how Australian sensitivities might be tackled. The proposed definition for defence industry also highlights the second weakness of the shipbuilding plan: it is focused on building and sustaining the structural component (the “float” and “move” aspects), rather than the total capability the ship or submarine represents. The lists of skills cited as necessary are those primarily associated with building and sustaining the structure. The shipbuilding plan gives scant coverage to the important combat system and weapons elements upon which the war-fighting capability rests. The plan does not address the industrial capabilities necessary for the local maintenance and improvement of these ships. Access to the detailed design information for the combat and sensor systems in particular is required so that such systems can be upgraded locally if required. An offshore equipment supplier may not give the same priority to our needs. Australia’s alliance with the US, and the access to advanced technology and information it provides, will remain critical. The plan therefore implies that sovereignty is sought for the “float” and “move” aspects of the naval capabilities, but not necessarily for the important “fight” aspects. This means the systems elements of ships and submarines will be tackled in some other context – outside the naval shipbuilding plan. A successful implementation will provide significant benefits for the Navy in terms of force structure, for industry in terms of a long-term enterprise upon which to grow overall capability and capacity, for innovation, for workers in terms of continuity of effort, and for the development of shipbuilding-related STEM skills. These are all worthy outcomes. But sovereignty is more than just “doing stuff” in the country. If the plan really wanted to tackle sovereignty, it should have provided a foundation on which aspects of industrial and operational sovereignty could be properly assessed, prioritised and managed. It would also have addressed the systems aspects of ships, rather than just the structure.